The more often you buy the cheaper I will go. + FREE Comment Engagement [Customize Replies] + So you will get more then 60. 1. 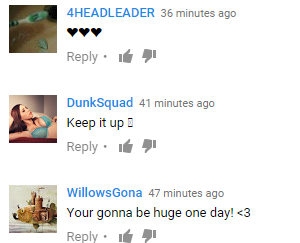 Can I spread my comments over multiple videos? Yes, however you wish. 2. Will they all come at once? No, I drip feed them so they have normal time stamps, and all have profile pictures and believable/normal profiles. 3. Will the comments look real? Yes, you wont tell the difference and can tell me exactly how you want them to look if you are not happy with them. 4. What bot do you use? I use a private coded bot, and its not for sale. 7. How can advertising comments help my channel? I can target any niche videos you want and talk about your channel in a normal way advertising it.Not even the video owner will delete the comments. 8. Can I have the comments write to eachother? Yes, in any way that you wish. - I will not provide comments to people spreading malware under any circumstances. - I will not give you a refund if you mess up your custom comments but will provide you extra comments if it where to happen. - NO Refund will be given if your video gets removed as it is not my fault. NO CPA / PPD comments UNLESS THEY GET SOMETHING (ANYTHING/Even a useless ebook/file) IN RETURN. Is this available? I would like to take the review! Can i get Vouch copy ? is the vouch copy still available ?